TDA2822 is a monolithic integrated audio amplifier can be configured in stereo mode or bridge (BTL). The IC has low crossover distortion, low quiescent current and is available in 16 pin DIP package power. The TDA2822 may be operated from a supply voltage range of 3V to 15V. The main applications are headphone amplifier TDA2822, portable audio, radio, mini headphones, preamp etc. The IC can deliver an output power of 0.65W per channel into a 4 ohm speaker 6V @ HV mode 1.35 W stereo and a speaker 4 ohm high voltage supply 6V @ bridge mode. IC TDA2822 stereo set shown in Figure 1. The left channel input is applied to the noninverting input (pin 1) of the first built in the amplifier stage and the right channel input is applied to the noninverting input (pin 16) of the second amplifier. The inverting input of these built in amplifiers are grounded separately using 1000uF capacitors (C5 and C6). The amplified outputs (left and right) are available at pins 6 and 11 of the IC. 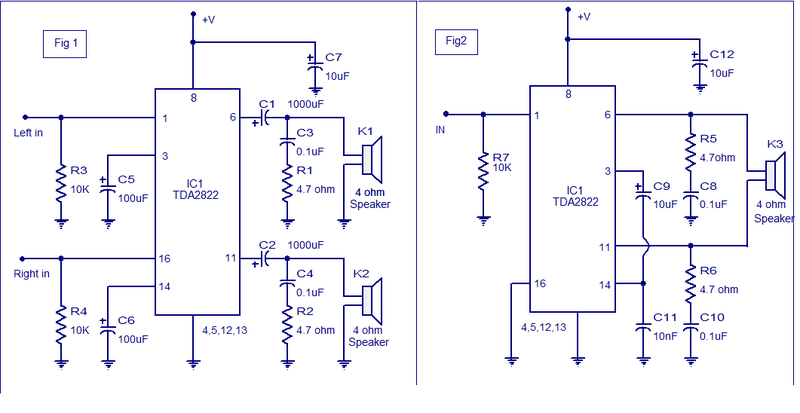 The outputs are attached to the respective speakers, using capacitors C1 and C2 respectively. 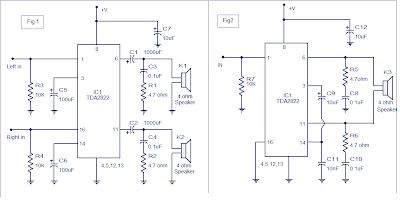 The branch capacitor resistance (ohms 0.1uF and 4.7) connected via the speakers are designed to improve stability and avoid high frequency oscillations. C7 is the power supply filter capacitor.